The diagnosis and treatment of multiple myeloma, a cancer affecting plasma cells, traditionally forces patients to suffer through a painful bone biopsy. During that procedure, doctors insert a bone-biopsy needle through an incision to get a bone marrow sample—or make a larger incision and remove a section of bone via surgery. 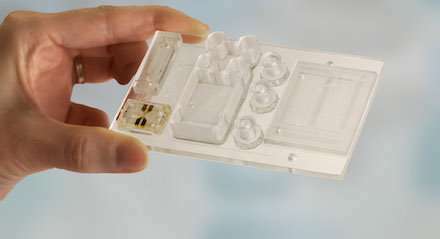 A new University of Kansas research effort featured in the current edition of Integrative Biology has resulted in a low-cost, reliable blood test that uses a small plastic chip about the size of a credit card that can deliver the same diagnostic information as a bone biopsy—but using a simple blood draw instead. "For the last 10 years, we've been developing a blood-based test for a variety of cancer diseases—one of them is multiple myeloma," said Steven Soper, Foundation Distinguished Professor of Chemistry and Mechanical Engineering at KU and a member of The University of Kansas Cancer Center, who led the research. "We'll be able to eliminate the need for bone-marrow biopsies and allow the clinician to determine the best way to treat the disease using a blood draw. From this test, the clinician will be able to determine the stage of the disease, what type of drug will best treat the disease and monitor for signs of recurrence if the disease goes into remission." "BioFluidica has been around for about two years now and is making excellent progress in bringing this chip-based technology to market," Soper said. "Patients will soon be benefiting from this technology. We're already doing clinical testing on different diseases using this technology at Children's Mercy Hospital in Kansas City on pediatric patients with acute leukemia. It's the same premise—we are looking for tumor cells in blood to see signs of disease recurrence, negating the need for a bone biopsy." "We've demonstrated the utility of this technology in a variety of cancer diseases," Soper said. "Here, we're homing in on multiple myeloma, but we've developed tests for two forms of leukemia and for pancreatic cancer, prostate cancer, ovarian cancer, colorectal cancer and breast cancer. With our technology, we'll be able to see if patients are developing cancers before they have overt symptoms and help improve survival." For Soper, the work on the microfluidic technology goes beyond academic or entrepreneurial interests—like so many Americans, his life has been touched by cancer. "This is very important to me," he said. "Just like a lot of people, I've experienced a family member dying of cancer. My dad passed away from colon cancer, and he never had a colonoscopy. A lot of the technology we're developing can minimize the need for these invasive screening technologies like colonoscopies and bone biopsies. This is important for screening but also to assist doctors to provide the correct medication to patients and monitor for recurrence." "At some point, you'll just go in for your yearly physical where they'll do a blood draw anyway," he said. "But then they'll screen it for cancer."